One of the joys of collecting are the unexpected – but fascinating – historical and artistic surprises that sometimes accompany a purchase. 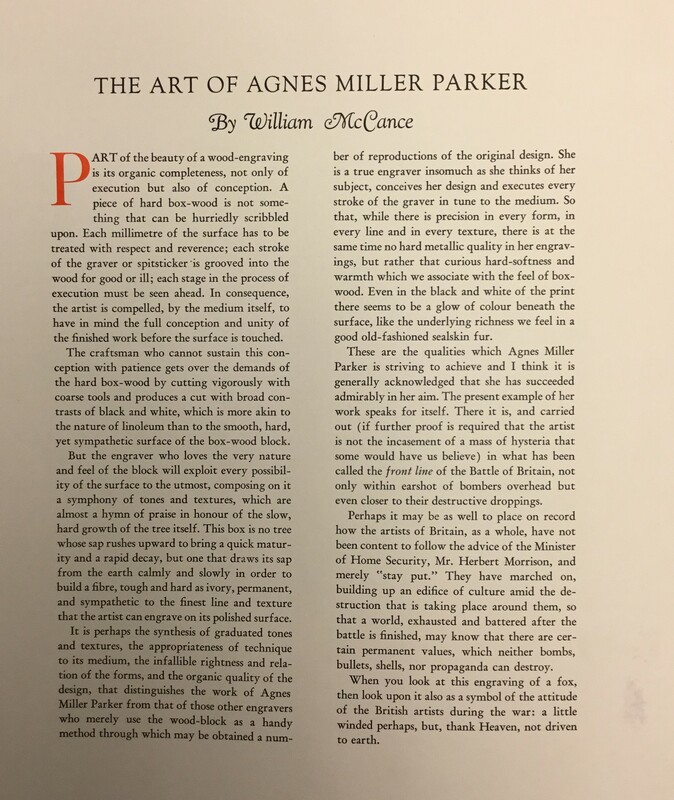 A case in point is a wood-engraving I purchased several months ago by Agnes Miller Parker. 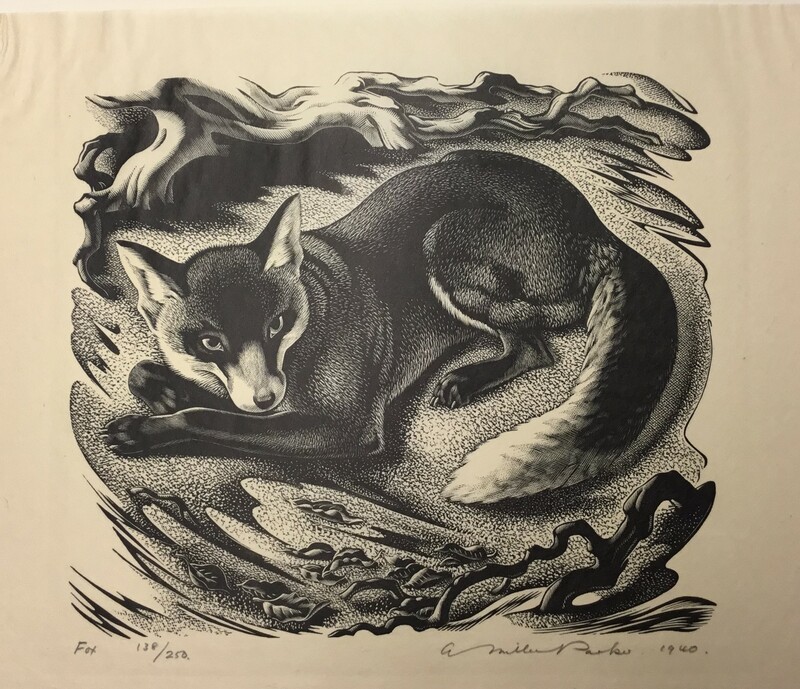 The piece, “Fox”, was the 1941 Presentation Print of an organization by the name of The Woodcut Society. This organization was the creation of a man by the name of Alfred Fowler. Fowler was a commodities trader with an interest in art, an entrepreneurial spirit, a love of prints and many connections and friends in the printmaking community. Two of these friends were Bertha Jaques and James Swann. Both Jaques and Swann were the Secretary-Treasurer of the Chicago Society of Etchers at different times and Swann held the same position with the Prairie Print Makers for many years. Swann and Jaques were part of Fowler’s extensive network that resulted in The Woodcut Society (and another organization called the Miniature Print Society) being very successful in obtaining “Presentation Prints” from many of the finest printmakers of this era. Over the years we have purchased a number of these prints. My wife and I have donated three of them to the Amon Carter Museum in Fort Worth. They are the 29th Presentation Print “Reflection in Crystal” by Asa Cheffetz, the 40th Presentation Print “Queer House” by Norman Kent and the 37th Presentation Print “The Four Net Menders” by Robert Von Neumann. “The Four Net Menders” is currently on display at the Museum. my aunt recently passed away and we discovered a collection of woodcut prints. is there any where/one that I could take these and have them appraised or should I throw them away? The first thing I would do is go through them to see if any appeal to you. If you like it, keep it – even if you do not have a place to hang it right now. Then take pictures of at least some of the woodcuts. It is very difficult to find someone to appraise prints because the cost of the appraisal is often a significant percentage of the value of the print. However, most print dealers or auction houses that specialize in prints can look at pictures of the prints and give you a pretty good idea if they have any value. They will look at quality, the artist, the subject matter and the condition. You can also do research yourself by looking for similar prints sold on ebay, by dealers or auction houses. I would hate to see you throw them away without having at least some idea of their value.